Bellabox Chinese New Year Giveaway! Win 5 Beauty Boxes! You are here:Home » Product Reviews » Bellabox Chinese New Year Giveaway! Win 5 Beauty Boxes! 2013 has been a wonderful year for Luxury Haven, with us hosting more than 20 Giveaways from beauty, food to hotel stays! 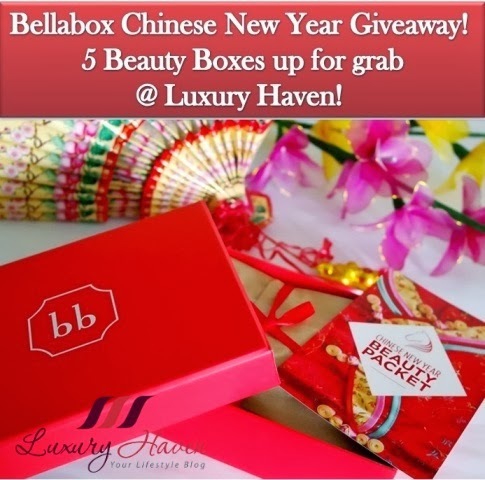 To kick off the New Year, we're pleased to partner with #bellabox, giving away 5 January bellaboxes to readers of Luxury Haven! Re-launched in Singapore in September 2013, COVERMARK focuses on offering the most natural concealing method through their star product range – the foundation. This moisturising makeup base helps foundation glide on and fit closer to skin, creating a radiant complexion with even-toned skin. To use: Apply a pearl-sized amount to face after using toner and essence. Comes in 8 shades, it's "Reborn" skin in one coat! To use: After applying base, smooth the foundation over your face with the sponge provided starting from the forehead, before spreading it evenly over the entire face. For areas of concern, dab additional foundation topically, patting lightly to blend around the edges. Create the stereoscopic appearance of beautiful skin. Take advantage of light for fine textured skin with lustre that lasts all day. To use: After applying foundation, take some powder with the puff, and finish by pressing lightly onto face. The COVERMARK sample set also comes with a SGD 10 Gift Card for your shopping! Available in a compact that uses a cushion and puff for skin-friendly and easy application, this BB liquid formulation contains 5 in 1 benefits - it brightens, contains SPF 50 PA+++, cools, tones and is long-lasting with sweat-proof technology! Retail: SGD 59 for set of 2 x 15g. Read more about their launch some time ago at Laneige Star Products Launch At ION Sky! Cyber Colours contains exclusive formula from France that infuses your nails with natural vitamins and nutrients. Free from petroleum or any harmful substance, environmentally friendly and available in 49 shades, chip resistant and durable. A soft, velvety and creamy clarifying mask formulated with Rosemary Water to purify skin from deep within. Retail: 50 ml for SGD 48. It sounds almost absurd that the brand’s products were created originally from shampoos and conditioners for horses. 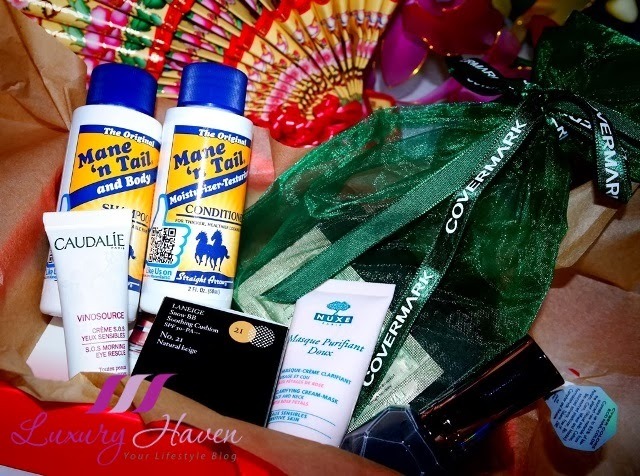 Mane ‘n Tail has since received countless unpaid celebrities’ endorsement like Jennifer Aniston and has earned its name and credibility as an iconic hair care brand that was featured in pop cultural media references. Retail: 355 ml for SGD 14.90 each. A gentle eye cream to quench and soothe the delicate eye area. Organic Grape Water continuously hydrates and White Tea Extract provides gentle de-puffing action. Anti-oxidant rich grape Polyphenols protect against fine lines and wrinkles. Retail: 15 ml for SGD 40. Cleanse and refine at the same time using Eslor Soothing Refiner and Cleanser. Grimes and greases are removed without stripping away the natural and necessary lipids on the skin. Formulated with a delicious blend of Honey, Apricot Kernel Powder, Whole Wheat Flower, Almond Meal and Corn Meal, scrub those grub away and reveal a fresher and revitalized skin after. Use twice weekly, the mask is enhanced and formulated with Seaweed extracts, Minerals and Proteins for a lasting smooth and soft luminosity. A regenerative and calming day and night cream that helps improve the skin's suppleness and vitality. The combination of Ginkgo Biloba Blend and Super Oxide Dismutase help to offset the damage that leads to premature aging. I'll be covering more on the COVERMARK Flawless Fit and Laneige Snow BB Soothing Cushion in my quarterly review, so watch this space! Now for the Giveaway! Simply "Like" and "Share", and tell us which items in January bellabox attract you most. Contest begins 17 Jan 2014 and ends on 28 Jan 2014 at 12am. #Giveaway is only Open to Participants Residing in Singapore. Tell us which items in January bellabox attract you most. Post your answers in the comment box below. Select "Name/URL" under 'Comment as:' if you do not have a Google a/c etc, and leave URL blank if you do not have one. Do not comment as “Anonymous” or we won’t know who you are. Items in the bellabox may vary. Use the Rafflescopter tool below to share the Giveaway photo on Facebook. Make sure the same Giveaway pix appears correctly on your wall, and it's set to 'Public' after sharing so we can verify. If you do not have a Facebook a/c, share on your Google+. * No notification will be sent to winner, so please look out for the winning announcement here or in Facebook. Make sure you SUBSCRIBE TO LUXURY HAVEN (right-hand side of the blog) and have the announcement delivered right into your mailbox! Thank you bellabox, for the festive giveaway! Nuxe Masque Purifiant Doux Clarifying Cream-Mask..I heard a lot about their products, but never tried it...So it will be great way to try & pamper myself..
Mane ‘N Tail Original Shampoo and Conditioner. Have heard raves about it and wish to try it! Your blog is great for giveaway. Shirley I haven't received the goodie bag yet. Happy Giveaway for 2014, Shirley!! All the best to those who are participating! Wow! Nice beauty giveaway. Good luck to all partipants. I'm excited to try the Laneige Snow BB Soothing Cushion! Nuxe Masque Purifiant Doux Clarifying Cream Mask . Leave skin fresh and tightened, Skin looks purified, toned and stimulated. Wish Bellabox and Shirley A Happy And Prosperous Lunar New Year. My favourite item is Eslor Comforting Mask. 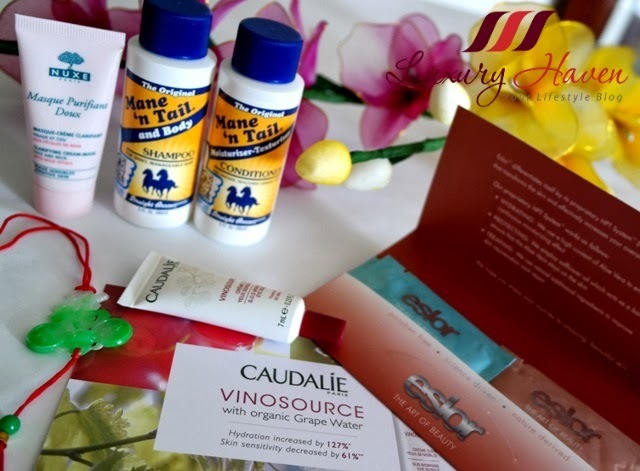 The Caudalie Vinosource S.O.S Morning Eye Rescue looks the most attractive of all! I hope to be one of the lucky winners of this giveaway. Thanks Shirley and Bellabox! #Nuxe Masque Purifiant Doux Clarifying Cream-Mask (15 ml)! It has been a very generous year at Luxury Haven, Shirley. Looks like you're off to another gift giving year! Good Luck to all and thanks for sharing these incredible beauty products! Louise, certainly hope to do another Int'l one soon. Thanks, dear! I will love to try Mane ‘N Tail Original Shampoo and Conditioner. Thanks for such a wonderful giveaway! Laneige Snow BB Soothing Cushion (4g) for me. I am looking forward to the Laneige Snow BB Soothing Cushion! Love the Song Hye Kyo look much. Happy CNY, everybody! 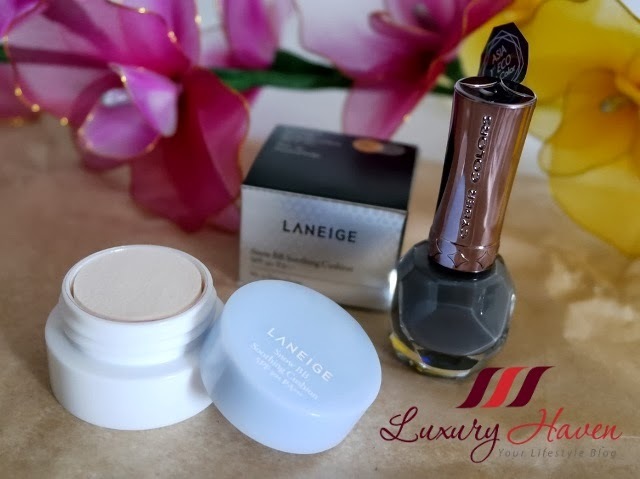 i really wish to try #Laneige Snow BB Soothing Cushion as right now i am ussing bb cusion of etude house but not up to my expectation hope this well.. I love to have the Mane and Tail shampoo and conditioner. I have used it and definitely adore it. I want to be the envy of others when they see my silky and smooth hair. Wow, just dreaming about it already makes me happy. I would like to try the Mane ‘N Tail Original Shampoo and Conditioner. Thanks for wonderful giveaway! Mane ‘N Tail Original Shampoo and Conditioner! Yay!